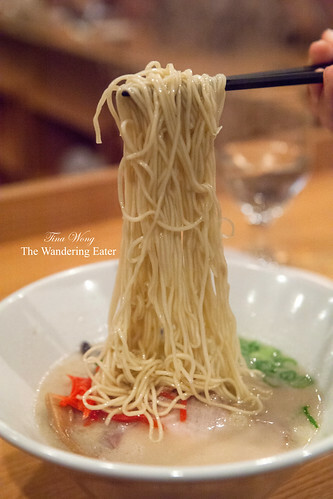 The ramen craze hasn’t slowed down ever since a few Japanese restaurants started importing to Manhattan for the past few years. 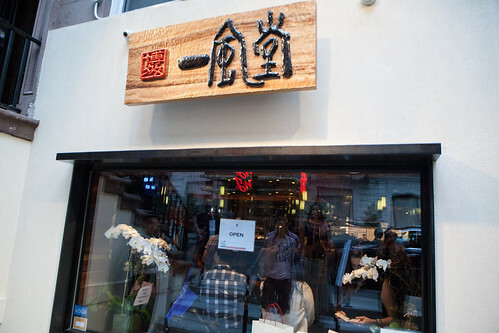 Ippudo (finally) opened their second location in Midtown West (specifically, Hell’s Kitchen) about a month ago and the noodle crazed tourists, hungry business people, and New Yorkers been cramming into this moderately small restaurant ever since. From my experience of waiting and dining there last night, the wait time is generally not as bad as their East Village location (one of my earlier experiences down there) where I remembered waiting over a good hour for a table of three during the 1 PM lunch rush. As experience gives you insight, I had a great friend who was willing to put down the name earlier before I was able to arrive there to avoid the potentially painful long wait. The interior of the place is much more streamlined than the East Village location, most notably, it’s devoid of that huge tree-like whisk that stood as the focus piece and now has this beautiful blonde wood, long U-shaped noodle bar to eat. There are tables in the adjacent room so groups can dine together. As for the menu, it’s slightly different. 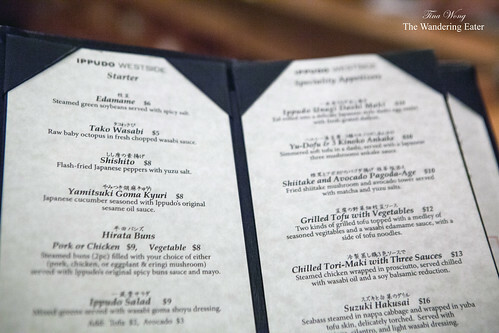 The Midtown menu has several dishes that are not found in the East Village menu and admittedly, it reads more refined. 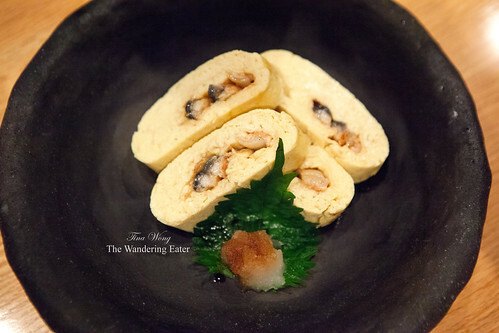 We had the Unagi Dashi Maki ($10), chopped grilled, sweet eel rolled into a sweet, thick yet quivers by the touch of chopsticks, Japanese style dashi egg omelet. Thankfully, the sweetness was broken up a bit when you do add the soy drizzled, grated daikon for a touch of cold, and the needed salt and bitter. 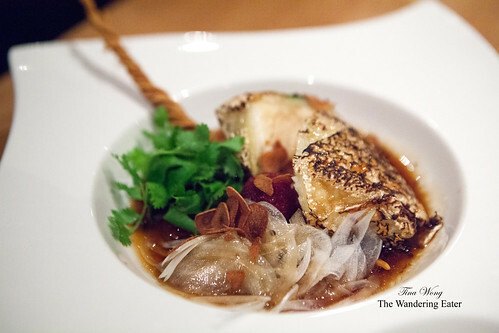 The Suzuki Hakusai ($16), sea bass steamed in napa cabbage and wrapped in yuba tofu skin that is briefly torched to make it look like fish skin and give the fish portion some texture and structure, sitting in a small pool of light soy wasabi dressing. This was an unexpectedly, sophisticated fish dish I’ve eaten in the longest time. The twee mountain peach found in that plate (seen here) added a touch of red berry-like sweetness. You must get it. If it were the usual sweltering dog days of summer, I would have eaten this sea bass dish instead of the ramen. Heresy? Sure but it was light yet it was pretty substantial. Since it was chilly yesterday (it wasn’t its typical heat wave style of 90+ degrees Fahrenheit with humidity), we had to go for the ramen. 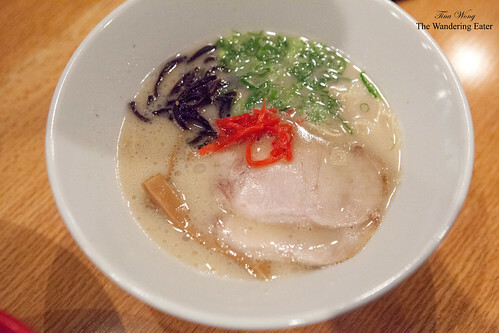 The original Shiromaru Hakata Classic ($15) was based on a tonkotsu pork broth with Ippudo’s signature dashi and thin noodles topped with pork loin chashu, sesame kikurage mushrooms, red pickled ginger, and scallions. The broth wasn’t too rich (in a very good way) and the salt really stood out. 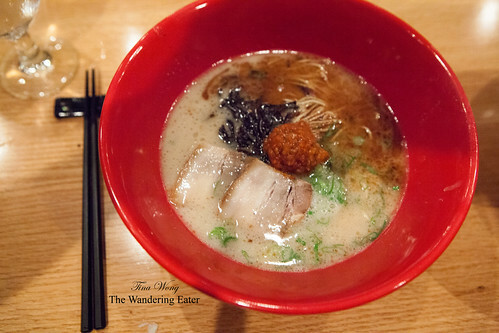 The Akamaru Modern Ramen ($15) is considered Ippudo’s bolder, modern translation of the original tonkotsu pork broth with thin noodles. It’s topped with their supposedly secret umami dama red miso paste, which did make it taste richer and sweet and slightly salty at the same time. It’s accompanied with a few slices of tender pork chashu, cabbage, kikurage mushrooms, scallions, and fragrant garlic oil. 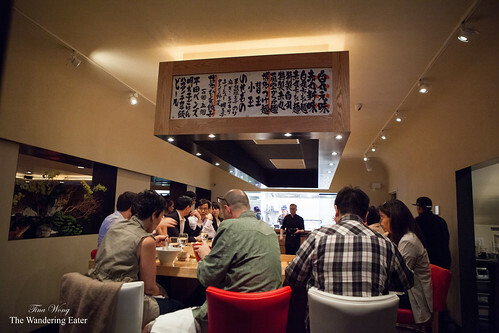 The ramen were slurable and warmed our bellies from the unusually chilly summer night in New York. Both Ippudo locations are very good for ramen and both does ask of you to wait for a fair amount of time, unless it’s during lunch (maybe not so much when NYU is back in session for East Village) or you’re dining solo. TwEAT Dinner with American Express & Paper Magazine's Super(Duper) Market - WTF?